The good news for Saudi Arabia is that its economy is booming. The bad news for us – and for the Saudis as well – is that the Kingdom is consuming more and more of its precious petroleum resources, and within a decade may have to begin cutting back on its oil exports to the rest of the world. Steady diversification into gas began in the early 1970s; but Oil’s share in the energy mix has nevertheless begun to rise again over the last six years. In a recent report entitled, “Burning to Keep Cool: The Hidden Energy Crisis in Saudi Arabia,” Chatham House researchers Glada Lahn and Prof. Paul Stevens said unchecked growth in energy consumption in Saudi Arabia was a “cause for international concern.” If it continues at its present rate, this would threaten the Kingdom’s ability to stabilize world oil markets. Current consumption trends in the Kingdom could deprive the world market of up to 2 million barrels per day (bpd) by 2020, under the International Energy Agency’s supply scenario. Khalid Al-Falih, president and CEO of Saudi Aramco, the Kingdom’s national oil company, has warned that Saudi crude export capacity would fall by about 3 million bpd to under 7 million bpd by 2028 unless domestic energy demand growth is checked. Source: United States Energy Information Administration. Graph by Index Mundi. Current trends, if unchecked, will also cause mounting economic and social pressures on the Saudi Government. Without income from oil exports, the Kingdom won’t be able to pay for its ambitious social programs. Saudi Arabia currently relies on oil revenues for about 80 percent of its government spending, according to official figures. Chatham House warns that present Saudi energy policies are not enough. Plans to add renewable power would help maintain fiscal balance for another two or three years, but that’s all. As for Saudi plans to move into nuclear power, given the lead times involved, this initiative would have little or no impact within the coming decade, when serious problems will start to mount. Saudi Arabia hopes to buy itself some time with major energy conservation efforts. Saudi Aramco is pursuing an initiative in cooperation with the Kingdom’s utilities and business sector to generate massive energy savings on as rapid a timetable as possible. This initiative includes moves into renewable power sources like solar and wind, plus efforts to slash energy waste and duplication and create a business culture sensitive to energy efficiency. 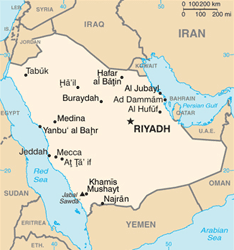 Over half of the power used in Saudi Arabia in the summertime goes into air conditioning. Saudi Arabia has a vibrant AC manufacturing industry, but the current business practice is to export high-efficiency units to other countries and sell the cheaper, low-efficiency air conditioners inside the Kingdom. Tougher regulations are needed, but communication efforts with the Kingdom’s consumers are also required, to acquaint local shoppers with the importance of buying high-efficiency units, even if they cost more. Chatham House believes “huge economic, social and environmental gains from energy conservation are possible in Saudi Arabia” but it cautions that the longstanding Saudi tradition of low energy prices and the Kingdom’s sluggish bureaucracy pose “challenges” to implementing needed pricing and regulatory reforms. On this latter point, Saudi Aramco has just announced a new educational program that seeks to provide critical training for some two million Saudi young people entering the work force by 2020. The program is in keeping with King Abdullah’s vision of creating a “knowledge economy” in Saudi Arabia – similar to that of South Korea or Singapore. It would also reduce the Kingdom’s dependence on expatriate labor. Ithra Youth, a new national initiative announced this month by Saudi Aramco’s Al-Falih, aims to help teach young people the principles of science, math, engineering and technology skills, as well as special skills to build personal, lifelong learning skills. Beginning in June, the program will provide 500,000 hours of training in 2012 alone. And where will the new jobs come from? Saudi Aramco is banking to a large extent on the petrochemical sector. The oil producer is joining forces with Dow Chemical in a venture called Sadara to manufacture a wide range of petrochemical products in Saudi Arabia and hopefully spark a new generation of industries, creating plastics and other products for domestic and export markets. Presumably the Kingdom will also be moving into its own renewable energy industries. Over the relatively short term, Saudi Arabia is aiming to generate about 10 percent of its power needs from solar energy by the year 2020. Saudi Aramco and Showa Shell of Japan hope to begin producing thin-film solar cells in Saudi Arabia within a few years. The two companies have already launched a pilot solar power plant project in the Kingdom and are planning others. We can anticipate similar moves for other renewable energy sources. The Kingdom’s master plan for creating six “Economic Cities” throughout the country shows a desire to diversify the economy beyond the hydrocarbon sector. The cities will take advantage of the knowledge economy concept, emphasizing education and advanced communication technologies. But these projects will take many years to complete. The first, King Abdullah Economic City north of Jeddah, is scheduled for completion in 2020, but most observers say that is a very optimistic deadline. ROBERT LEBLING is a Senior International Affairs Fellow at the National Council on U.S.-Arab Relations and a communications consultant. He has worked as a journalist in Egypt, Lebanon, and Saudi Arabia, and as a corporate communications specialist for Saudi Aramco. 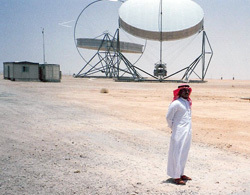 This entry was posted in Energy, Robert Lebling, Saudi Arabia.